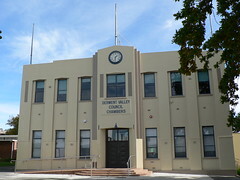 The Derwent Valley Council Chambers in New Norfolk, near Hobart, date from 1935. The year is, unusually, on the side of the building but more about that later. The decoration is minimal but illustrates the rule of three deco principle perfectly. There are three sections to the building, three steps in the roof line and three steps in the central tower. Three windows on each floor either side of the tower, three flag poles and even three decorative elements above the door with the central one a stepped pyramid shape with, well, three levels. I mentioned the date on the side of the chambers. 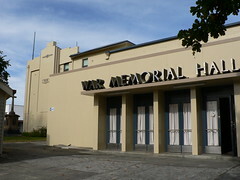 You can see it at the left of this picture of the War Memorial Hall, an interesting building in its own right. 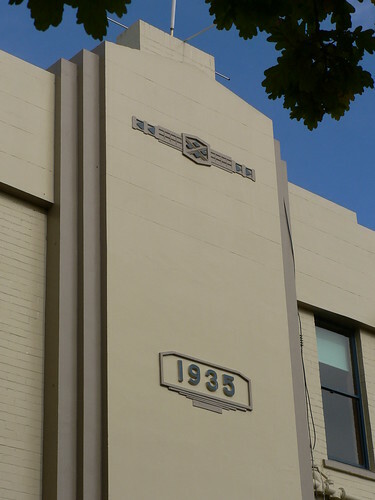 A series of headlines in the Hobart Mercury newspaper between 1949 and 1954 show that raising funds and getting approval to build the hall was a drawn out process. The result though, I think, is a handsome modernist building. But back to that 1935 year marker. I find it a strange place to put such a marker but there must have been a reason. Functional, great proportions, minimal decoration. Wonderful. I won't mention the fire and burglar alarm. I will mention the steps and ramps. Bad. I know we have to make allowances for modern living & legislative requirements and some places take some care to make the changes more appealing than others. This one isn't too bad but it is annoying to see a lovely symetrical building spolit with an inappropriately placed modern addition. You can always be creative and balance a real fire alarm on one side with an identical fake one on the other. There are lots of creative designers out there that could come up with better solutions than I could dream up.